So look around you and see where YOU can see God’s fingerprints. Is it in nature? Kids? Animals? Where do you see them? To participate in Fingerprint Friday. Just click on the title of my post above or click here and it will take you to PamperingBeki’s blog. Follow the instructions! 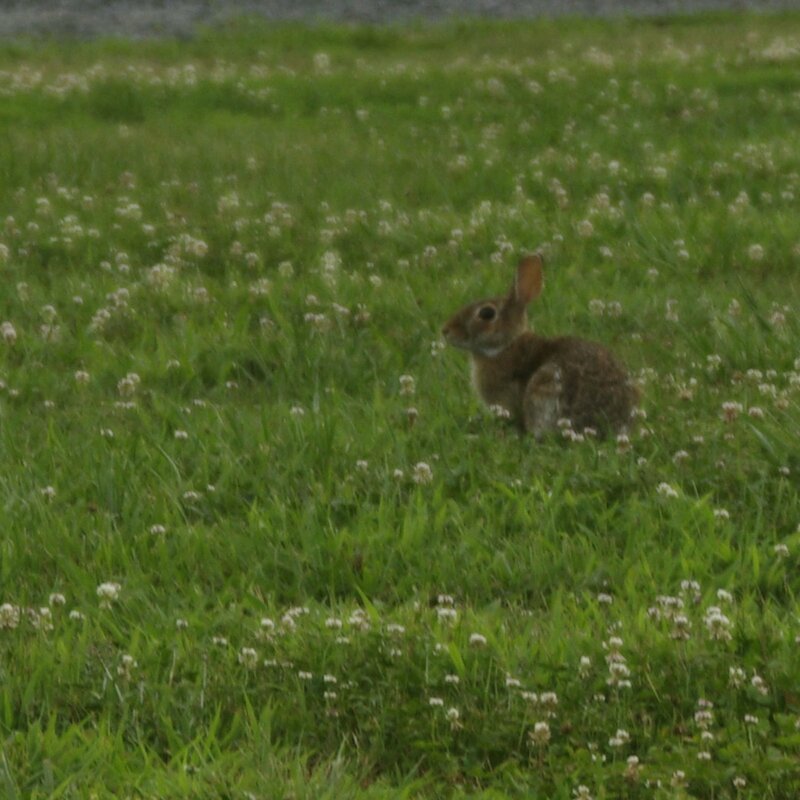 This is one of the wild rabbits that lives on our farm. How do you tell the difference between male and female rabbits? I don’t know. I like to think of this one as a female. I don’t know why. She’s brave and curious. She knows she is fast and can easily outrun me and the Toy Poodle (who is old and quite blind and has no interest in a rabbit at all) so she lingers when she sees us. She sits very still and you can barely see her brown coat in the grass and clover. I am thrilled each time she appears. She is a bit camera shy but is becoming very patient with me. She lets me get fairly close and then I simply have to take that one extra step too many and off she goes. She can fairly fly. Her huge cotton tail bouncing as she speeds across the pasture and slides into the growth along the fence. I suspect there is a rabbit hole under there leading to her nice little home. I think her home has several doors. One leads to our flower bed along our pool fence and I believe there might be one under the brush by the front pasture. I think her name is Rhianna. Rhianna Cotton Tail. She is one of God’s amazing fingerprints and I hope she will make her home here for many years to come. Look around you at all the wonders He has made! Next Post I Love Winning! She is wonderful! Great photo! We have bunnies in our yard but they never let me get as close as yours.